Over the last few months, we’ve been looking at a range of psychological devices marketers use to influence buyer decisions and increase conversions. Today it’s all about the mere exposure effect, one of the most widely used techniques in advertising and marketing over the last fifty years. Otherwise known as the familiarity principle, the mere exposure effect explains the human tendency to favour things that we’re familiar with. Right away you can see how this is a fundamental principle behind advertising campaigns designed to increase brand awareness. In theory, the more familiar people are with your brand, services or offer, the more favourably they’ll view it. In practice, things are a little more complex than that. We can’t simply bombard people with the same marketing message and expect them to bite, sooner or later. We have to be a little more strategic with our approach to using the mere exposure effect. So here are seven ways you can use this principle effectively to boost conversion rates. To make the most of the mere exposure effect you need to capture leads early. Introduce your brand at the last stage of the buying process and you’re at a disadvantage over your competitors who have been building familiarity with users along the buying process. Help consumers choose which products are for them and business owners what kind of software options they should consider. Even if you’re not promoting your own brand at this stage, you’re establishing that initial connection and capturing a lead early on in the buying process. Using the mere exposure effect, you can nurture this lead to build familiarity and boost your chances of people choosing you when it comes to making the final purchase. Facebook is a great platform for making the most of mere exposure. The network is better suited to building brand awareness than directly converting leads and its targeting options mean you can pinpoint audiences that are most likely to do business with your brand later on. One tactic that works really well with Facebook is to target people based on life events or previous purchases that mean people will be in the market for what you’re selling in the near future. For example, you know that newly engaged couples will be thinking about honeymoons. Likewise, pregnant women will soon be in the market for prams and a wide range of baby products. And people who are looking at buying a new car will need to review their insurance policy in the near future. Targeting these people with ads for your own products before they even realise they need them gets the mere exposure effect in motion at the earliest moment. While you can use regular search ads to leverage the mere exposure effect, it tends to be an expensive approach. If you’ve got the budget for it, don’t let that stop you. Dominating page one with AdWords text ads and a top spot in the organic listings for popular searches is a great way to trigger the exposure effect. You can also bid on your competitors’ brand names to sneak your brand into the mix and get things started. If those approaches are too much for your AdWords budget, then try this one on for size. Using the Display Network you can target users with visual ads based on the websites they visit. So people searching for a new phone can be targeted with gadget insurance ads, for example. Business owners looking for WordPress themes can be targeted with ads for specialist hosting. Once you get users on your site, AdWords remarketing allows you to target users with ads on the Display Network after they leave. So leads that don’t convert right away will see your ads as they continue to browse the web and the mere exposure effect works its magic. The key with AdWords remarketing is not taking things too far – and this is important with the mere exposure effect in general. You don’t want to show people the same too frequently or for too long a period, otherwise you’ll end up frustrating them. Be strategic with your ad choices, use ad variations and set a time limit on your remarketing campaigns. 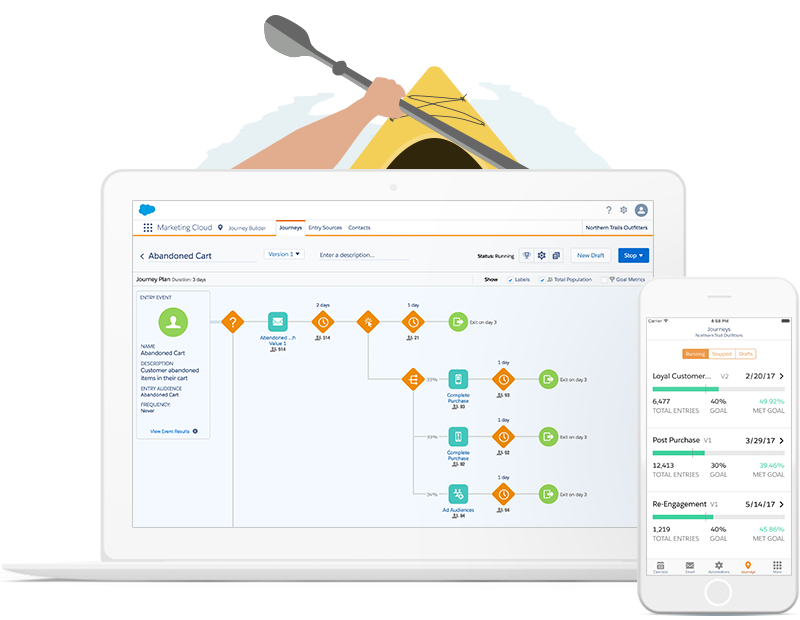 Salesforce‘s marketing automation makes it easier to target consumers at every stage of the buying journey. As marketing automation technology matures, it’s getting easier to target users over an extended period of time while changing your message to meet their developing needs. As I said in the previous point, targeting users with the same ad for too long causes more harm than good. It also dilutes the impact of your message which doesn’t adapt as their demands change. For example, a consumer in the comparing-products stage of the buying journey will respond differently to someone looking for reviews of a specific product. Marketing automation means we’re now able to target these same users as they progress through the different stages of the buying journey and adapt our ads to meet their changing needs. The mere exposure effect kicks in when your brand is repeatedly in view, but in a way that doesn’t frustrate users because you’re constantly addressing their needs. As marketers, we tend to obsess over differentiating brands as a means of standing out from the competition. This is a fundamental marketing principle that’s hard to argue against but there are times where you might actually want to blend in. For example, a life sciences company doesn’t want a website design that makes them look like an online casino. Likewise, a technology startup doesn’t want to follow the typical design convention of a non-profit organisation. This is because brands want to feel familiar to new and regular users despite needing to communicate some kind of unique selling point (USP). You can also use the mere exposure effect against your competitors by targeting their USP and turning it against them. Or, better yet, turn their biggest weaknesses against them. Samsung has a great history of doing this against Apple and the Korean tech giant has just launched a new ad campaign attacking the iPhone X release. In its latest anti-iPhone ad, Samsung picks at some of the faults, lacking features and missing headphone jacks that iPhone users have had to put up with over the years – prompting the central character to switch from iPhone to Samsung. This ad works on so many levels and the iPhone criticisms aren’t the most important thing going on here. Samsung has hijacked the release of Apple’s most anticipated release in years used it to promote its own brand at a time when everyone’s attention is focused on Apple. And it works, too – because the press coverage for this ad has been pretty big. Not to mention the predictable backlash from iPhone loyalists who only end up promoting the video even more. The mere exposure effect helps explain why building brand awareness is such an important marketing strategy. You have to be strategic with your efforts, though, because nobody wants to see the same brand name everywhere they turn. So let your brand take the back seat sometimes and allow your marketing message to shine through. Adapt your messages for consumers as they work their way along the buying process and make the most of today’s automation and targeting technologies to reach them with the right message, at the right time.